Photo courtesy of Carl Grice. Found at hotel in China. In fact, it’s made by pig’s feet, which tastes a bit salty and hot. 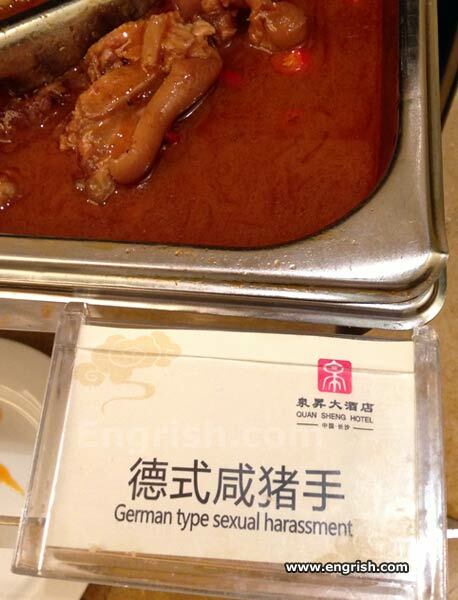 Where can I get the Japanese Sexual Harassment? But I’d like to add, the Chinese characters printed in the picture is not Chinese per se, it is actually Hongkeey “Chinese”, originated and limited in Hong Kong, where pu tong hua (the Chinese official language) is butchered as much as English. And even their own local language is a mess, mixed with 10-30% English words, simple words like ‘fing’ (friend), ‘sheetorbilee’ (strawberry). I doubt even God knew what they’re saying. I don’t believe the English translates the Chinese characters. I think it refers to the pink logo on the upper right showing the one eyed man with the third leg. @Sam Dunno, try the seafood restaurant.